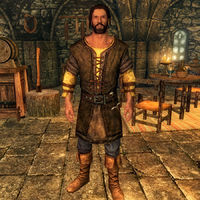 Sorex Vinius is an Imperial who works at the Winking Skeever in Solitude, and is the son of the owner Corpulus Vinius. He expects to take over the inn, should anything happen to his father (see bugs). He grew up with Vivienne Onis and Roggvir. They were friends as children until Sorex confided his feelings for Vivienne to Roggvir. After that point, Roggvir teased Sorex incessantly, and even abused his former friend to embarrass him in front of Vivienne. Sorex came to hate Roggvir, and he is present to see his former friend executed for treason. Upon raising Sorex's disposition, he becomes a potential candidate for marriage, and makes low value items freely available. Sorex wears a set of farm clothes along with a pair of boots. He carries the key to the inn, a belted tunic, and a selection of common loot and gold. In combat, he relies on an iron dagger. If you have already agreed to find news of Angeline Morrard's daughter, Sorex will not offer his delivery quest. If anything happens to his father, Sorex will only rent out the inn's rooms; he does not offer any merchant services.